The email arrived the fifth morning of the fire. On that day, the numbers were: 30% contained, thirteen fatalities confirmed, total number dead, forty-two. My husband, college-aged daughter, and I sat in our kitchen nook, sharing updated statistics and stories flowing through our social media feeds. 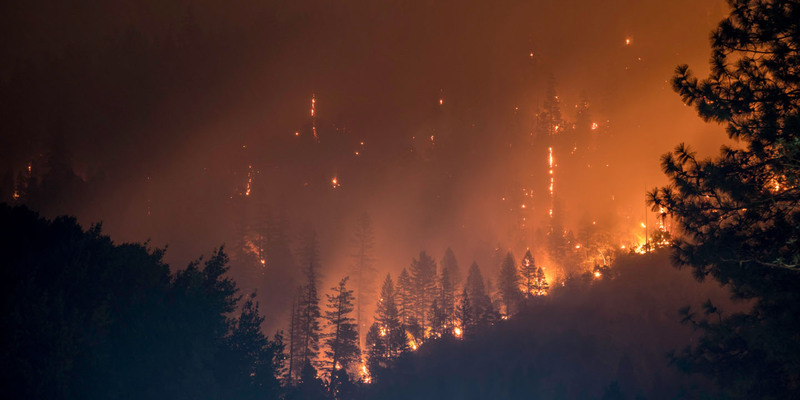 Our coffee and oatmeal grew cold as we attempted to find a boundary around the unimaginable losses we were witnessing, which, weeks later, would conclude with an almost complete loss of Paradise, California, and other smaller mountain communities just ten miles from where we live. Tucked in the tangle of emails from students who’d evacuated their homes and the university announcing the closure of campus due to dangerous air quality was a message from an editor at The New York Times asking if I would consider writing “a poetic dispatch for us of what it's like right now on the ground there.” He’d found my writing online and saw I lived close to Paradise. It would be a quick turnaround—published that evening or the next morning. We had, indeed, been “on the ground.” Packed bags and memorabilia stood stacked next to the front door, but after staying up in shifts the first night of the fire, because of many factors—old animals, shifting winds, my mother’s reluctance to leave—we stayed. And if we were to stay, we decided, we’d put ourselves wherever help was most needed. Spending some part of each day at a church, donation distribution center, or, in my daughter’s case, with the animals, became an anchor for everything else. A kind of timelessness had taken hold, though perhaps the only measurements that mattered were of the fire—a burn rate of eighty football fields per minute, 30,000 evacuated, air quality index above 500. Yes, I emailed back, I will do my best to capture what’s happening here. Though I’d not yet written a word, I’d felt my writerly instincts piqued as we entered each immediate response center. My lifelong mechanism for processing trauma—to notice, narrate, and frame my and others’ suffering—led me to ask people questions, to watch the ways in which conflict rose up and settled, to wonder at the industry of giving. I knew it would all find its way into my writing eventually, but in this first week, the focus was on survival. But then this invitation to write, right now, arrived. In the past, writing happened after the fact. The material was intimate to my own life and had benefitted from many years of perspective. To capture this moment, this place, from my vantage point, was exceptionally daunting. Information would be outdated within twenty-four hours. Knowing the size of The New York Times’ readership, and knowing this might be the first or last time someone would hear of the natural disaster unfolding in the community I’ve lived my entire life, I was terrified to get it wrong. Most of all, I wanted to honor those on the front lines, those who’d lost everything. With the help of my family, I took four pages of notes cataloguing images, moments, and shared realizations from everywhere we’d been. They left to volunteer for the day, and I sat down to write. For the next six hours, with few breaks, I drafted, cut, and revised, charged with an adrenaline-fueled fervor never felt before in my life. The teacher friends who’d fled down the hill with cars full of students were with me; the hospital ablaze where my daughter was born was with me; the rows of beds in the evacuation centers, the cacophony of the airport terminal full of caged dogs, the lines of people in N95 masks registering to volunteer—all of these threads pulled together as I wrote. "For the next six hours, with few breaks, I drafted, cut, and revised, charged with an adrenaline-fueled fervor never felt before in my life." I realized early in the process I could only write about my own small orbit and must let go of the desire to somehow represent all of the stakeholders in this devastating natural disaster. As a nonfiction writer, I’ve always known this. Yet, in focusing on the particularities of my family’s experience, countless others have reached out to say, Yes, it was just like that. Many more have messaged me to ask how they can help, and I’ve connected them with the local groups and resources doing the crucial support work in the aftermath. The small space I carved out made room for connections beyond what I could’ve imagined. Two and a half months later, the needs of our community have pivoted from the immediate to the ongoing catastrophe—unhoused people, bureaucratic obfuscation, as well as every kind of hardship that existed before the Camp Fire (addiction, poverty, mental illness). Cheryl Strayed says that the implied last line of every good story, whether fiction or nonfiction, is “and nothing was ever the same again.” I’d argue that this is also the invisible first line of everything we write as we live into and witness the rampant changes in our environment and our world. As writers, it falls to us to describe the now-ness of our fracturing, our proximity to harm, and the ways we come together in our shared brokenness. Sarah Pape (2016) teaches English and works as the Managing Editor of Watershed Review at Chico State. Her poetry and prose has recently been published or is forthcoming in: The New York Times, New England Review, Passages North, Ecotone, Crab Orchard Review, The Pinch, Hayden’s Ferry Review, and others. Her chapbook, Ruination Atlas, was published by dancing girl press. She curates community literary programming at the 1078 Gallery and is a member of the Squaw Valley Community of Writers. Check out her website for more: www.sarahpape.com.